My husband is a professional photographer (and I help) so we go to loads of weddings. Last weekend, I had the opportunity to attend a wedding as just a guest. 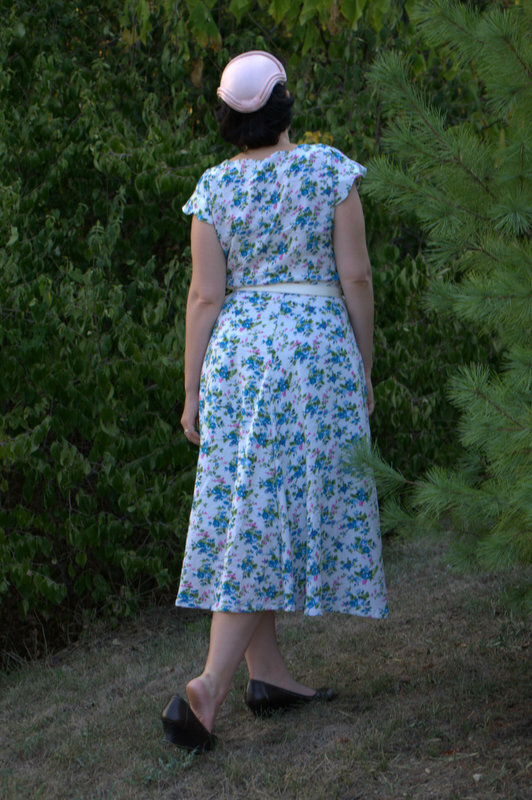 On Friday, I decided that I did indeed want a new dress to wear so I set about whipping up this dress. Wear again? Yes. 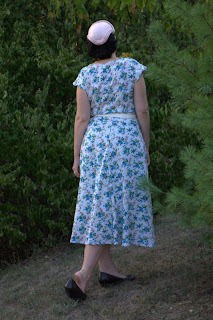 I want to make the sash that goes with it and shorten the hem a bit. I decided that it was a bit long but I didn't have time to rehem it before the wedding. I did view 2 on the right. I found the most adorable rose shaped buttons for this project at Jo-Anns. 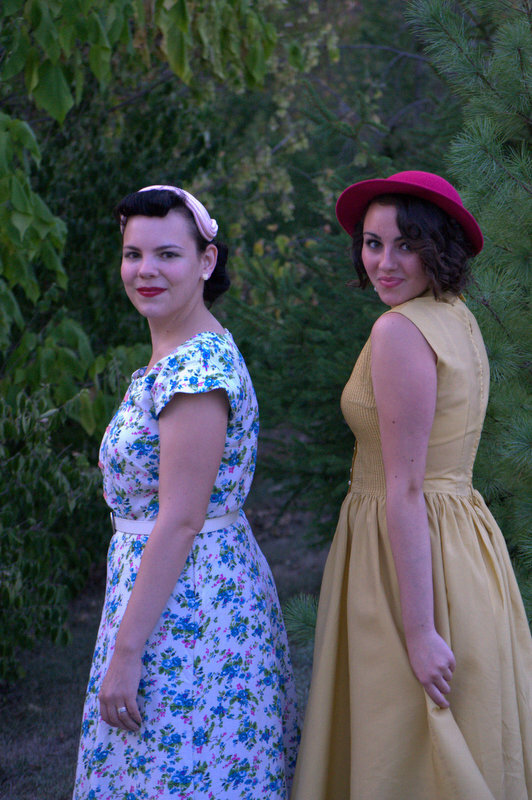 I completed the outfit with a vintage hat and thrifted belt. Me and my sassy mother-in-law. I also met another vintage loving gal at the wedding. 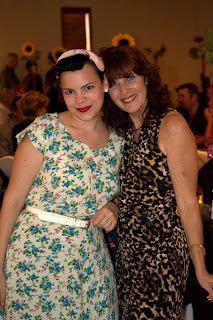 Her name is Sarah and she rocked the wedding in a darling vintage 50s dress and hat. She just started a vintage blog so pop over and say hi. Sarah has a few of our photo booth shots posted. So cute!! I can't believe you've made something with that fabric already! How immensely pretty! I'm in awe of people like you with the kind of sewing skills to knock of a garment like this in such a short amount of time. 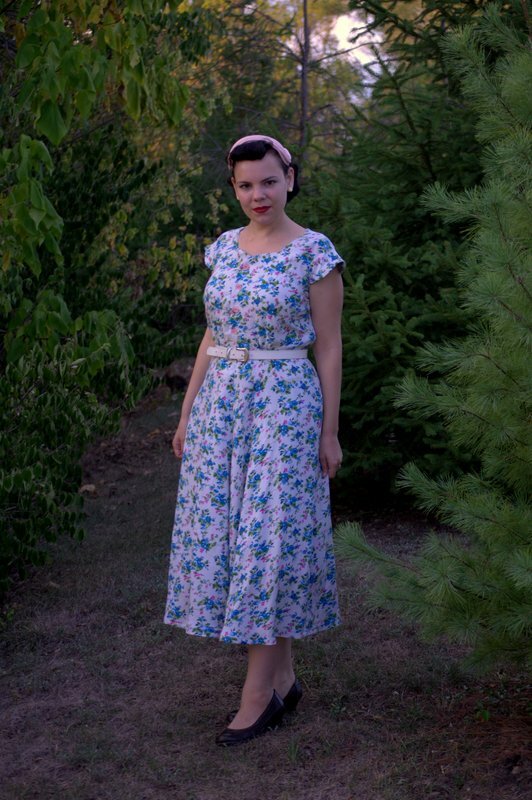 It's a beautiful dress (I really like the length as is, but to be fair I am partial to longer dresses and skirts) that looks fantastic on you, dear gal. gorgeous dress! you put the outfit together so nicely for the wedding! I esp love the little fascinator, such a nice vintage piece! WOW! It was so cute. I like it much. 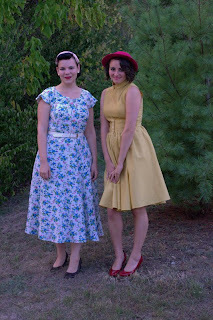 How neat to meet a new vintage lovin' friend! 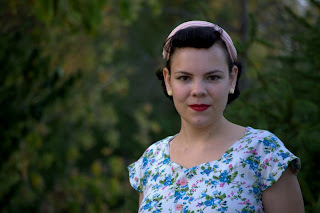 I stopped by her blog and now following it. What a lovely dress!!!!!!!!!!!! I love this pattern. 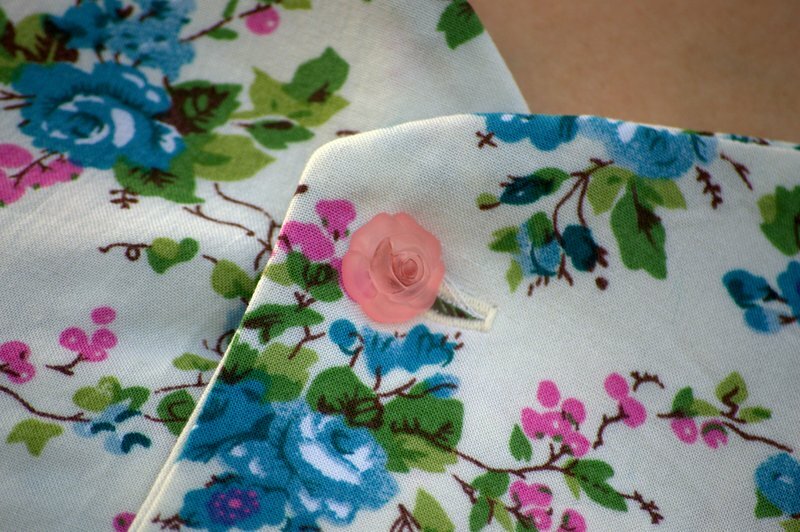 You are lucky to be able to sew things like this. Have you thing about making a matching belt with the same fabric? Will look fantastic together! You both look beautiful!! I have a weakness for yellow dresses though! !